Tired of the same old rainy days and humid weather in the tropics? 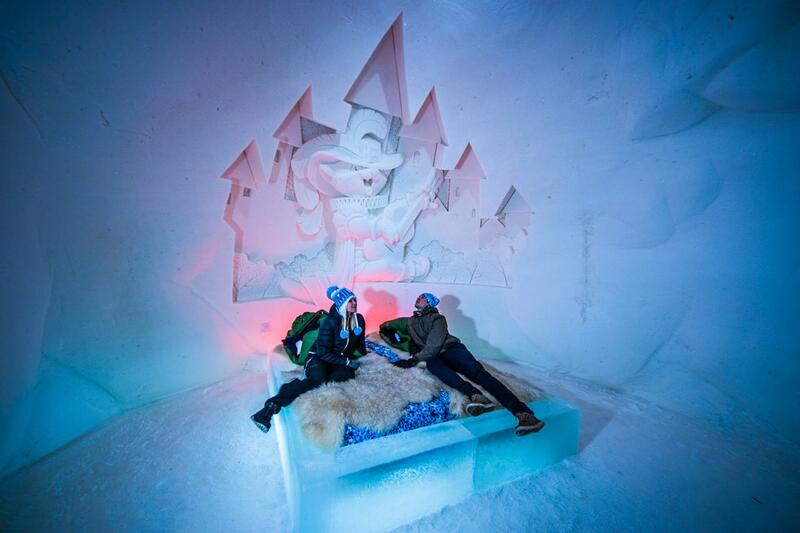 Get your gear ready and check in at one of the ice hotels this winter. These cool abodes, created entirely from ice and snow, are popular with intrepid travellers and those looking for something out of the ordinary. This winter, we pick five of the most incredible hotels around the world for you to experience. Touted as the original ice hotel that started the trend, Jukkasjärvi Ice Hotel in Sweden is located in a small village with just 1,100 people and 1,000 dogs. Every winter, thousands of visitors would flood the place hoping to catch a glimpse of the Northern Lights while artists from around the world would arrive to take part in the shaping of an art exhibition in snow, ice and light that constitutes the ice hotel – which takes a new form every year for the past 30 years. 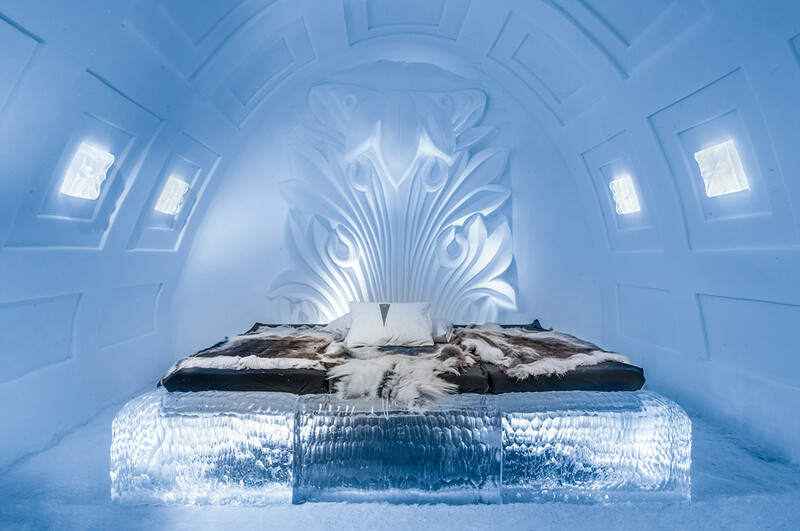 The permanent part of the hotel which is open all year round, ICEHOTEL 365, offers nine deluxe suites and 11 art suites made from ice and snow. Winter season is from October to February when visitors can experience the Arctic lifestyle and enjoy snow mobile rides, dog sledding or reindeer racing. 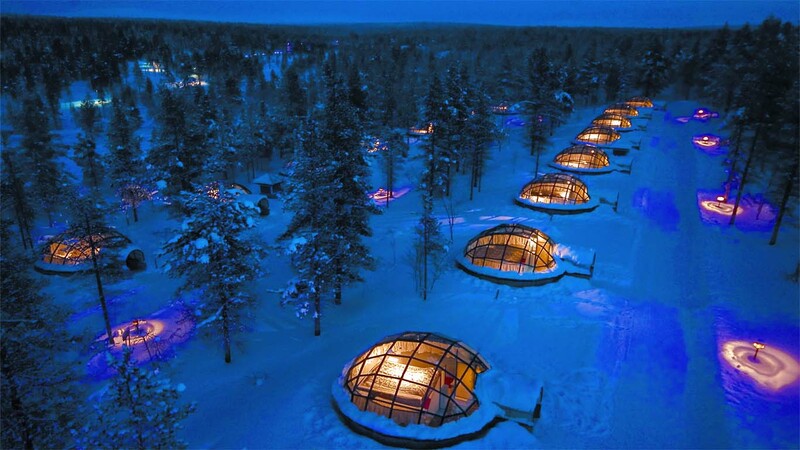 If you fancy sleeping in an igloo with a glass roof that allows you to see the Northern Lights (if you’re lucky) in bed, look no further than Kakslauttanen Arctic Resort in Saariselkä, Finland. The family-managed resort offers accommodation ranging from snow and glass igloos to log chalets and traditional houses. Lovebirds can opt for the queen suites or wedding chambers. 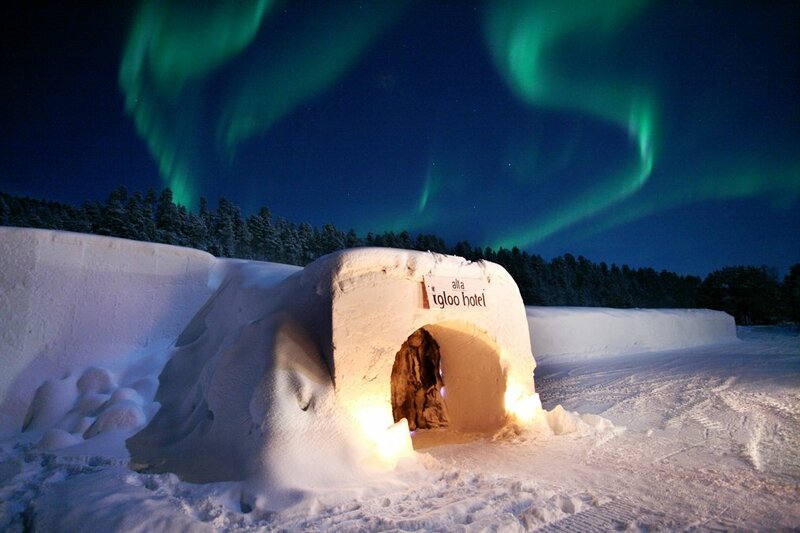 The snow igloos stay at a constant -3⁰C to -6⁰C even if the outside temperature dips to -40⁰C. Winter activities include sleigh ride safaris led by huskies, reindeers or snow mobiles, ice fishing, cross-country skiing and snowboarding. Around the resort, you can warm up in their smoke sauna, visit the art gallery or a huge log building called Celebration House, also known as Santa’s Home. The snow hotel at Kemi Snow Castle, or LumiLinna in Finnish, has been built and re-built with different themes every winter for over 20 years. While the main buildings at the snow castle are open throughout the year, the snow hotel is only available from January to April. If you have children in tow, Kemi would make a good choice for its vast snow fort, hailed as the largest in the world, and plenty of surprises including snow rides, dungeons, jesters, wizards and more. There is even a snow chapel and restaurant. If you find the snow abode too cold, you can opt for the Olokolo, a heated pod with transparent roofs where you can watch the stars at night. The family-run igloo hotel started with just six rooms in 1989 but has now grown to 26 bedrooms, four decorated suites, an ice chapel, an ice bar and a sauna to keep you warm. Every winter, the hotel will be built within five weeks based on local themes like Vikings, Nordic legends and myths and the surrounding Alta valley and Arctic wildlife, to name a few. Over the years, the hotel has seen its share of weddings, religious services, dinner parties, fashion shows and lots of other events. The hotel opens from 15 December 2018 with a short break from December 23 to 26, before resuming again. They also have a New Year’s Eve package which includes dinner, new year countdown and an overnight stay followed by sauna and breakfast the next day. Activities include snow mobile safaris, sledding by dogs or reindeers and ice fishing, among others. You can also head for the outdoor jacuzzi and sauna or arrange for a service at the ice chapel. If you find travelling halfway around the world to find an ice hotel too daunting, you’re in luck. There’s one operated by the famous Hoshino Resorts group in Tomamu, located in the northernmost island of Hokkaido, Japan – where the temperature can drop to -30⁰C. Their ice hotel consists of dome-shaped structures made entirely from ice and located within the ice village. As a guest, you can take a dip in their outdoor bath made from ice and surrounded by the white birch forest, followed by drinks at the lounge, also made from ice. There is even an ice chapel for couples looking to renew their vows and a spa offering massages and body treatments. The ice hotel will open from January 19 to February 28 in 2019 but outside those dates, you can still book a stay at their nearby hotels.